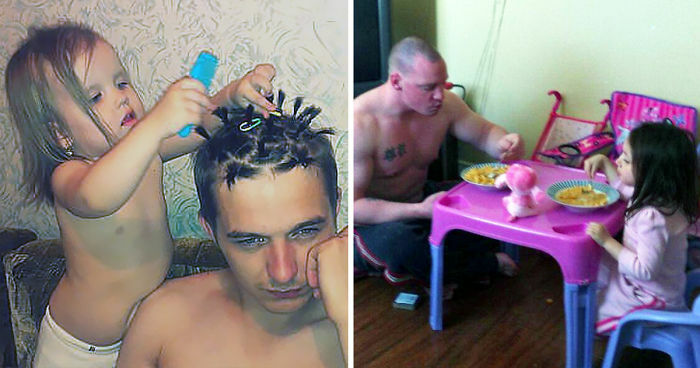 Fatherhood can be a tough and daunting task for first-time fathers, but with some of these genius dads' clever and creative strategies, it should be a breeze. These kids practically parent themselves! If you're a clever dad who can lend his expertise to this list, or if you've seen a comparable image, we'd love to see it added to this list! Vote for your favorite strategies too so that all of dad-kind can see it. So sweet. This is a picture to treasure always. Yes! Setting a good example for other parents on the tube, as well. This one is my favorite. There's just something about a man with muscles and tatts sitting at a pink table with his daughter. It's the DAD Ride at the amusement park. My son does this very thing with his little boy. That looks like something my Dad would have done. I think he should get out there and push his kid. A picture for the album for sure!! I think this belongs on the Awkward Family Photos page. Love his face on that! That looks like a fun family. How did he take the picture? #48 Best Resting Place? Sleeping Father! Okay, the dad just looks creepy in this one! #51 There's No Place Higher Than On Daddy's... Legs? #53 Getting The Perfect Pedicure! I wonder who else might like to take a bath with Dad? I didn't say that in print, did I? #59 Our Lips Are Sealed!! #65 ... And The Babysitting Uncle. #70 Pumpkin Artistry Getting Passed To The Next Generation. #72 Who's Daddy's Little Napkin? #78 Things I Need To Do To Get In Her Exclusive Club. #80 Watching Her Favourite Programme On Daddy's Phone. #83 Working Out + Video Games + Spending Time With The Kid = Winning! #86 A Man Who Just Laughs And Goes With It. #87 This Lil Guy Wouldn't Take A Nap Unless He Showed Daddy How To Glue The Eyes On Their Pumpkin.